I noticed you're on our Hangar Waiting List. I think we have an enclosed hangar coming available..."
It was from Joe at the Williamson-Sodus Airport. When I moved to Upstate NY in 2006, my airplane and I found sanctuary from the elements in a beautiful, brand new T-hangar built by Ray at the Le Roy airport southwest of Rochester. For a multitude of reasons, Kristy and I bought a house on the diagonally-opposed quadrant of the city, leading to a 45 minute one-way commute through downtown Rochester to reach the airport. The closest airport to my house is Williamson-Sodus (KSDC), a nice, club-owned facility. On my first visit in 2006, I met Joe, who placed me on the hangar list. It was made clear to me that club members would always be given preference on the list. I assessed the likelihood of advancing to the top to be slim. This occurred seven years ago. As the years passed, I came to regard Ray as my personal patron saint of aviation and his immaculately maintained airport as home. Joe's message obviously set me to thinking. Economics of time and money unambiguously show that a move to Williamson is the smart thing to do. A drive to Williamson from home is only half the distance that I drive to reach Le Roy. Less time driving means more time at the airport or with my family. Unfortunately, I have a sentimental streak a mile wide that always complicates these types of decisions. I logged 765 hours out of the Le Roy airport, each successful journey beginning and ending at the safe harbor of its runways. During that time, Ray was always there to help. I remember how Ray plowed away the late November snows from the runway specifically for my first arrival there in 2005. Ray stood vigil at the airport until my safe return the night I foolishly ran low on fuel and after the engine fire on the other side of New York state. There was also the time poor weather forced a diversion to Canandaigua when Ray and Darrell mounted a rescue mission for the Warrior without me even asking for help. After some thought, sentiment won out and I responded with a "thanks, but no thanks". I could not imagine willfully leaving my home. Then, two weeks later, another Facebook message. "We're putting internet into our hangars..."
Internet availability was not really a tipping point, but it inspired me to take a look at the numbers again. I estimated that I would save close to $300 in auto fuel and 36 hours in the car each year if I made the move. Numbers like that are enough to give a guy pause, even a really sentimental one. The hangar and club membership at Williamson would cost slightly more than rent in Le Roy, but this would be offset by the aforementioned savings and an avgas discount. The morning of the Williamson Apple Blossom Festival pancake breakfast, Kent, The Bear, and I explored the available hangar. It was an enclosed T-hangar with an electrically-operated bifold door. The structure seemed tight. While not as nice as my current hangar in Le Roy (in particular, an asphalt floor instead of concrete that made for a dark interior), it was perfectly serviceable. Other advantages of moving to Williamson include: a maintenance facility on the field run by "Helicopter Ray" whom I like and respect, an AWOS (automated weather observation system), LPV approaches serving both runways (possessing vertical guidance and lower minimums than the GPS approaches at Le Roy), and a larger / more active pilot community with regular Saturday afternoon cook-outs reminiscent of my days in South Haven, MI. Even Darrell thought I would be crazy not to make the move. So I decided to move (it's all Darrell's fault). The phone call to Ray was difficult, especially when the news was clearly disappointing to him ("it's not you, it's me"). At the end of the day, our friendship remained intact, but we will need to be more proactive about getting together. I was particularly pleased when Ray offered to maintain my security code at Le Roy so that I will have access to the airport office; in that way, Le Roy will always be a home to me. Kristy, The Bear, and I drove to Le Roy to pack up the hangar, meeting my mother who was on her way into town for a visit. It was a sweltering 93°F, a counterpoint to the icy November afternoon in 2005 when I first arrived at the airport. Once the cars were loaded, Kristy and my mother set off as a mini convoy of Subarus on a seventy-five minute road trip to Williamson. The Bear and I, by contrast, loitered at the airport prior to our twenty minute flight. Ray and Darrell came to see us off, waving to us from the open door of Darrell's hangar as I waggled the wings at them while climbing out. The Bear fell asleep at altitude for the relatively short hop through the heat and haze to Williamson. I always referred to the area immediately around Le Roy as my aeronautical backyard. My new backyard near Williamson is quite different - just off of Lake Ontario with favorite sightseeing destinations Sodus Bay and Chimney Bluffs nearby. Different, but nice. On the ramp, The Bear was still out cold. In fact, much to my surprise, I was the only one stirring at the airport; the place was unexpectedly deserted. Kristy and Mom would not arrive for another thirty minutes and Joe, president of the Williamson Flying Club, was significantly delayed. I roused The Bear and we waited in the air conditioned club house. Eventually, Joe arrived and we parked Warrior 481 in her new berth. The shiny walls of the hangar bathed the interior in an emerald glow, reflecting foliage from the woods opposite the open door. It was not until the next day (after only a 25 minute drive!) that I managed to put everything in its place. Compared to the night before, the airport was abuzz (literally) with activity. Several people stopped to welcome me to the airport. I met one fellow in the clubhouse who, when I told him that I flew a Warrior, asked if it was the "pretty blue and white one" that had flown into the breakfast. With my workbench reassembled and everything put away, I finally felt settled. I met at a former hangar occupant who retrieved some items that he left behind. I also found this stake in the corner of the hangar and wondered if Buffy was a former occupant of my hangar - if so, Mr Pointy was looking a little dull. As I powered down the door, I thought to myself that "home is where the airplane is". But home is also where the heart is and that will probably remain in Le Roy until I feel more at home in my new digs. Did I mention that the new commute is only 25 minutes? In nine years, I have never had the airplane so close to home! It's Apple Blossom Fly-In time again! Kent and his daughter joined The Bear and me on our annual quest for pancakes. We were not disappointed in our quest. It's my understanding that the eight pancakes we consumed between the four of us were a minuscule part of the 1900+ breakfasts served. Plus, it's always fun to see my friends from Williamson. I was pleasantly surprised to be recognized and greeted by a reader of the blog. That is not a common occurrence, but it is always nice to hear that someone else (besides me) gets something out of the blog! Good luck wrapping up that instrument rating, we both need it! I also ran into a friend from work who asked if we had flown in. When I answered in the affirmative, he turned to his wife and said, "see? He DID drive all the way to Le Roy just to fly all the way back here for breakfast." His wife, a local college professor for whom I have given some guest lectures in the past, looked at me like I was crazy. "It's not about getting to breakfast," I explained. "It's about having an excuse to fly somewhere." She accepted this explanation, but I still suspect she thinks I'm crazy. Stuffed with pancakes, sausage, and Mott's apple juice, we looked at airplanes, listened to the live band, and played with the little $1 helicopters (rotors on a stick) being sold. The Bear was entertained with that for much of the remainder of the day; it was the best $1 I've ever spent. At one point, I launched The Bear's helicopter and it landed on the fabric covered wing of a Taylorcraft L-2. For the record, there was no harm done. Regardless, please don't tell anyone. Cruising westbound along Lake Ontario, Kent assumed flying duties while I snapped some photos of landmarks along the way. First was the fishing pier in Webster Park, one of The Bear's favorite places to visit after a hike in the woods (and a nice vantage point for sunset viewing). As we crossed over the Port of Rochester, we turned southbound toward Le Roy. Kent got to put his dormant piloting skills to the test in the turbulence and held us within 100 feet of our target altitude. Back at Le Roy, we played with the helicopters some more and chatted with Ray and Phil. During that time, the girls decorated my car and themselves. Just another fun day at the airport! Recently, a group of aviation bloggers shared individual "origin stories" of how each one of them was bitten by the flying bug (disclaimer: there are no radioactive spiders in any of these origin stories). The individuality expressed in each tale was a delight to read; common passions born from disparate experiences. I was particularly struck by Ron Rapp's tale of slamming on the brakes while passing a flight school and making a snap decision that changed his life forever. What I find interesting about Ron's story is that it goes beyond him being in the right place at the right time. To my mind, it is about how a series of childhood experiences built upon one another until they were triggered at the appropriate moment. I think our past experiences prime us to make such decisions, whether we are conscious of that preparedness or not. October 20, 2002: Mom was my second passenger. Photo by Dave. Until the fall of 2000, I never had a conscious goal of becoming a pilot. So...how did I get there? I began to reflect on my own experiences and how they positioned me to act when I was in the right place at the right time. As kids in the 1970s, my friend Bobby and I built a fort out of cinder blocks with a roof made of salvaged lumber. Though we always referred to this drafty edifice as The Fort, the truth is that it was really a spaceship. It was too ungainly, even in our imaginations, to be a sleek, single seat X-wing fighter. Rather, it was the sort of craft that could travel between the stars, descending through the atmospheres of distant worlds to land on unexplored soil. In this way, The Fort was more like the Millenium Falcon than a stodgy, space-bound capital ship like the Enterprise. The front of The Fort was lined with a bank of sideways cinder blocks that formed a panoramic wall of windows like that on the Jupiter 2. Inside, Bobby and I sat before the windows, piloting our ship through the galaxy. A console was positioned between us (an old wooden telephone cable spindle) and a severed tree limb served as a control stick. In The Fort, we became pilots and explorers without ever physically leaving the ground or even Lake Orion, MI. made me feel like either Elliott Gould or Chewbacca, I'm not sure which. The first airplane to become an object of my obsession was the B-29 Superfortress featured in the Disney-produced Elliott Gould film, "The Last Flight of Noah's Ark". There was just something about the glassed-in nose that grabbed onto me and would not let go. Perhaps it simply reminded me of everyone's favorite Corellian freighter. I remember obsessively reproducing the B-29 in Lego (ok, it was a shoebox-shaped first approximation at best, but it had lots of windows up front). 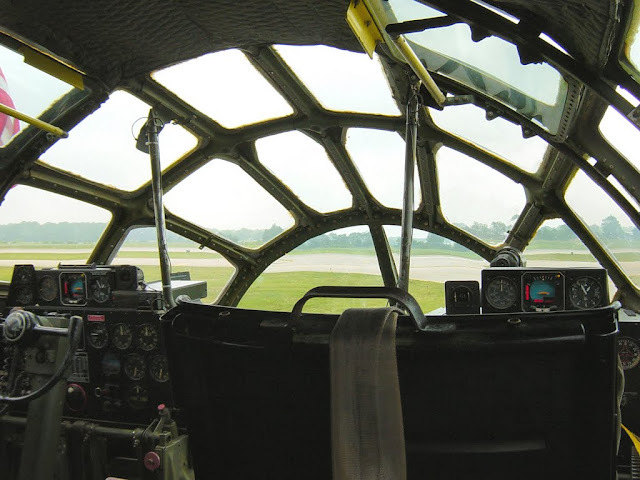 Twenty four years passed between seeing that movie and my first close encounter with an actual B-29 (Fifi) on the ramp of the Kalamazoo Air Zoo. 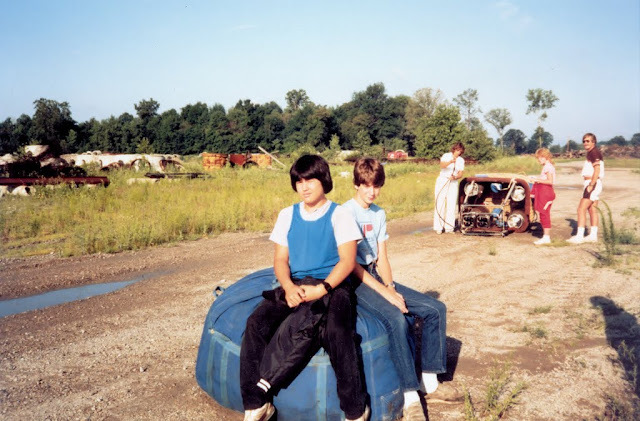 My stepbrother (left) and me (right) sitting on the balloon bag. Photo by Mom? 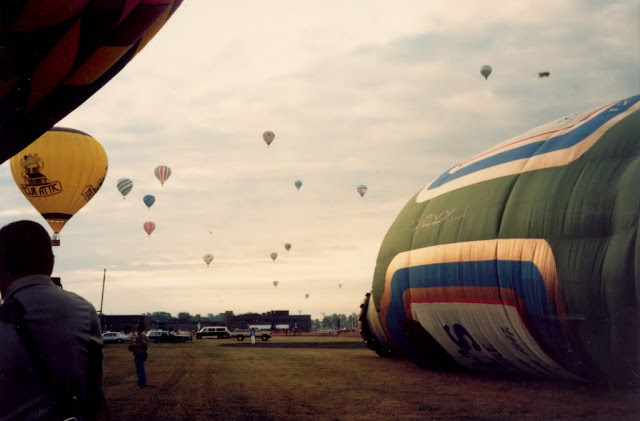 My first flight came circa 1985, slung beneath a hot air balloon shaped like a giant beer bottle. My stepfather was the beer and wine buyer for a major drug store chain in Michigan (which no longer exists, but Michiganders might recognize the logo on my tee shirt). 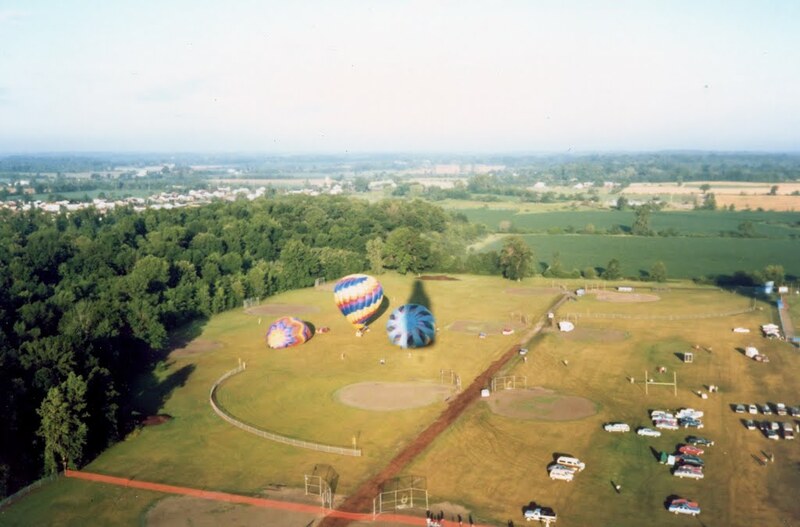 Through his connections, we met the Labatts "Flying Blue Crew" at a dawn balloon rally. 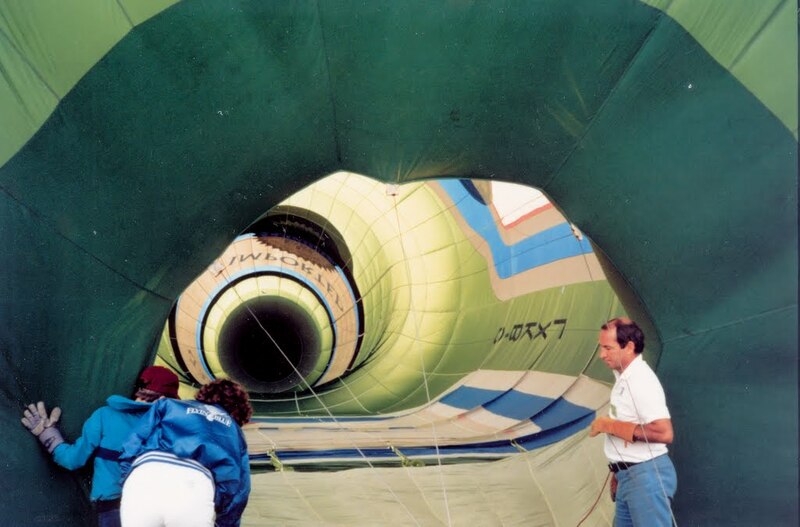 Inflating the giant Labatts bottle balloon. The registration number, seen here, is G-BKXL. Cameron Balloons Ltd. and that it has been out of service since 1996. Photos by Mom. I was amazed to see the unique balloon take shape while surrounded by its more conventional, spherical-ish brethren. For some reason, I was particularly intrigued by the detailed bottle cap. Love that shadow. Hopefully it's past 5:00 somewhere in the world! Photo by Mom. My mother and I went aloft in the balloon. We certainly cast an unusual shadow across the landscape compared to the other balloons. See that? That's me in awe (and in a chintzy Labatts hat). Photo by Mom. I almost refused to go because I was terrified of heights (ok, I still am), but the tall sides of the wicker basket and the smooth air laid to rest any fear of tumbling out. 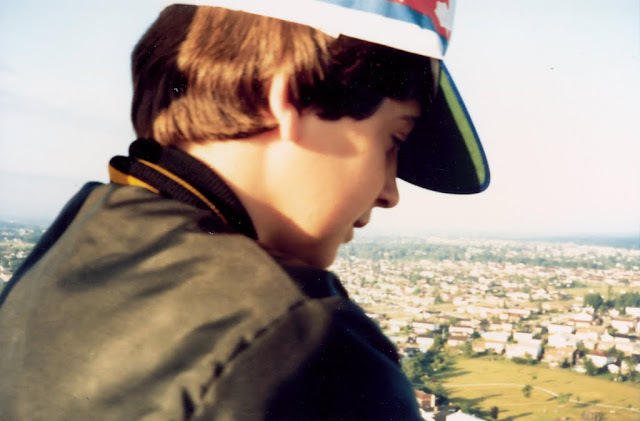 It was the most serene experience of my young life and my first bird's eye view of the world. It made a lasting impression. In 1999, I was in my final year of graduate school. With the exception of time off to interview for jobs and marry my best friend in the world, I was working in the lab seven days a week and up to eighteen hours a day in a final push to finish my degree. 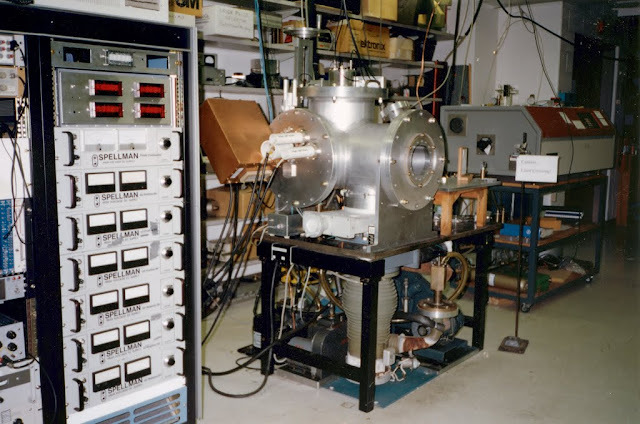 I was privileged to do some neat stuff in grad school at the interface of chemistry, physics, and biology. But after five years of hard work, I was on the verge of burning out and I craved freedom. Much of my laboratory time was spent in the dark (sometimes literally, sometimes figuratively), sitting beside a monstrosity that I had designed and built as a second year graduate student. Experiments were run to the accompaniment of a chirping Q-switch that drove a pulsed neodymium-YAG laser. I still hear that chirping in my sleep, a 5 Hz ostinato in the soundtrack of my life. spectrometer. Note the "Caution: Laser Crossing" sign, my weak nod to laser safety. Near the end of graduate school, Kristy and I relocated to Kalamazoo, MI. During that transition, I was driving back to my southern Indiana laboratory via eastbound I-94 when I passed the north end of the Kalamazoo / Battle Creek International Airport. Arrayed across the ramp was a training fleet of single engine airplanes (what I later came to know as Cessna 172s) belonging to Western Michigan University. After five years of near indentured servitude, I was on the cusp of emancipation (graduation). I looked at those ungainly birds and thought to myself that there could be no better expression of true freedom than learning to fly someday. But this was an idle thought, quickly lost in the chaos of defending a dissertation. I also fell victim to a common fallacy. I did not personally know anyone who flew and believed that it was beyond the reach of "ordinary" people like me. It never occurred to me to train for a private pilot certificate because it never occurred to me that I could. Early 2000s, sitting in the cockpit of a Grumman Bearcat during my first visit to the Air Zoo. Photo by Dave. Kalamazoo was my own personal Kill Devil Hills, where the dream of flight became a tangible reality. Part of this inspiration came from the presence of the Air Zoo, a world class aviation museum located there. I was so inspired by the place that I became a docent. I joined The Company in 1999 after a long hiring freeze, thus becoming one of a cohort of younger scientists hired that year; the next generation. Part of this cadre was Kent, another Indiana graduate student who graduated before I did. Another was Dave, an exceptional scientist and private pilot. 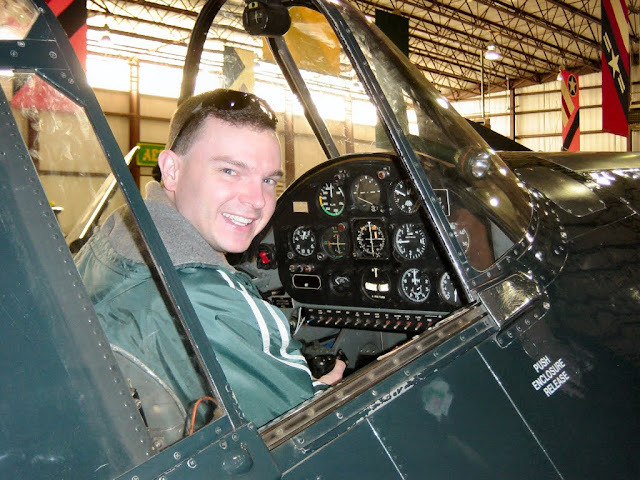 September 17, 2005: Dave in his Stearman. Photo by Gary E.
I remember learning that Dave owned an airplane. "You have your own plane?" I said to him, while gaping in awe. "You have to take me flying sometime." How was I to know that any pilot worth his salt would be so eager to indulge? In the fall of 2000, Kent, Kristy and I joined Dave at a battered t-hangar in Dowagiac, MI - a field from which I would solo roughly one year later. We helped him extract his pristine red and white American Champion Citabria from the ramshackle hangar. We departed from a turf runway, the best way to experience a taildragger. Once aloft, Dave surrendered the controls to me and pointed to a nearby lake. "Fly a circle around that lake." He then grasped the airplane's steel tube skeleton with both hands to demonstrate that he was not on the controls. I was out of my comfort zone, but gingerly grasped the stick and coaxed the Citabria into a shallow bank. The controls were surprisingly responsive. 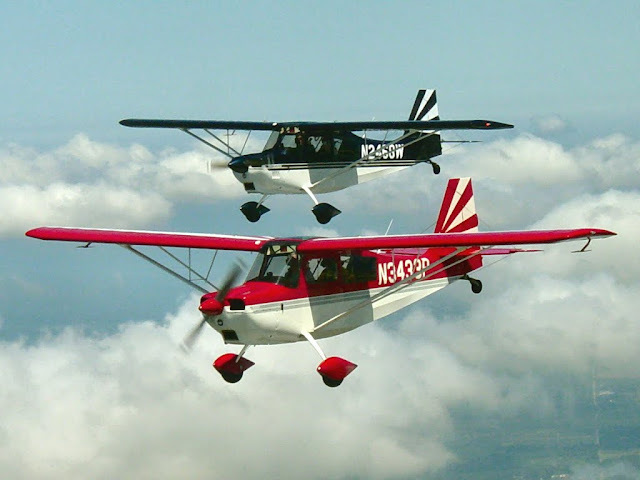 I pushed the stick left to bank the aircraft and the Citabria pushed back as her ailerons deflected into the air. first light airplane flight off the wing of Warrior 481. Photo by Jonathan W.
As I pushed more, I could feel the pressure in the controls change, continuously telegraphing the interaction between the airplane and the air that held it aloft. The experience imparted an incredible feeling of freedom and control. While at the controls of that airplane, physics actually sang to me. The ride was soon over, but the hook was set. Potential energy built over the years like a spring forcibly compacted. Youthful adventures in The Fort, the fascination with spaceships and airplanes, seeing the world from a new perspective from the basket of a hot air balloon, and contemplating the WMU training fleet at Kalamazoo when I sought freedom above all else; all of these things built on one another, waiting for just the right catalyst. Dave was that catalyst. As an aircraft owner and part of my peer group, he demonstrated that it was all within my reach. I knew in that moment that I had to learn to fly. 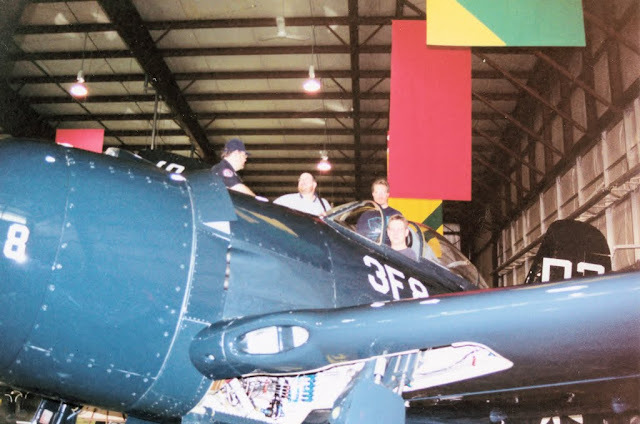 February 14, 2004: Kent "Lima Bravo" making airplane noises in the cockpit of the Air Zoo's Hellcat. 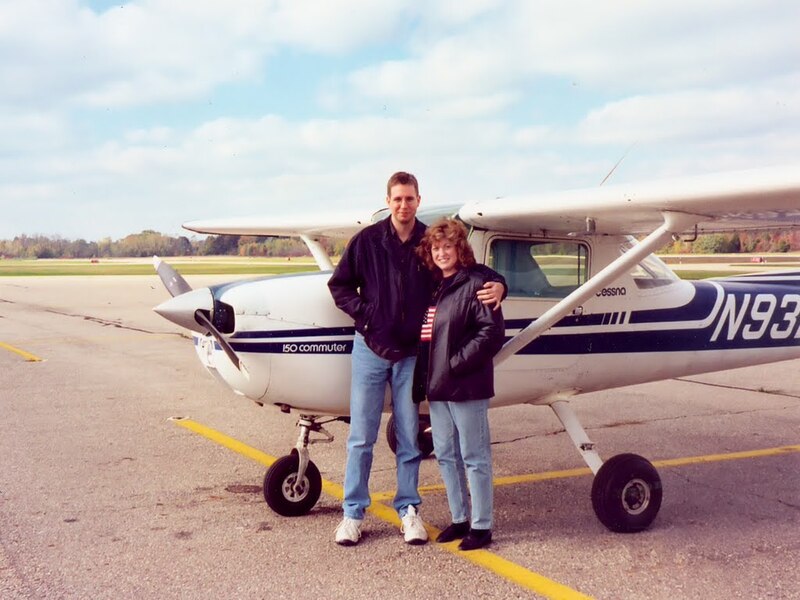 Within a month, Kent and I started a ground school course via Kalamazoo Community College. To this day, I am still not quite sure what our instructor, who held a fresh bachelor's degree from Western Michigan University, thought of us; two recent PhDs sitting in the front row peppering him with questions and challenging anything that violated known laws of physics (such as the popular "equal transit times" myth he used to explain lift). I am, however, quite certain that we annoyed the heck out of our classmates, several of whom were struggling to pass (and many of whom did not). Comparing notes with Kent made flight training far more enjoyable, especially because we view the world through a similar lens. But mentorship from Dave, the experienced aviator who always listened, encouraged, and offered suggestions where warranted, was a significant contributor to my success. I earned my private pilot certificate on September 23, 2002 with training from the fine folks at Conrad Aero in Three Rivers, MI (20 minutes south of Kalamazoo). I managed to beat Kent to the check ride by a month because of my "better qualifications" (i.e., dumb luck, better weather, and an ounce of opportunistic behavior). 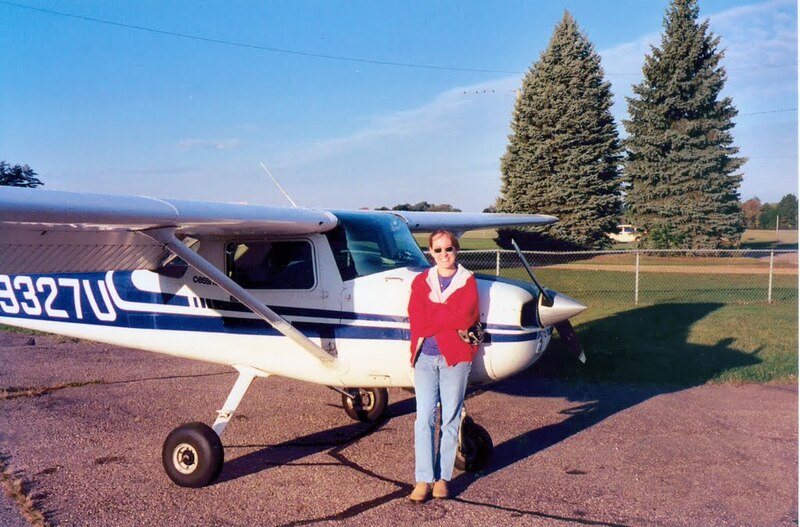 October 6, 2002: Kristy and N9327U prior to my second flight as a certificated pilot. Returning to the original question, how did I get here? I think it was a combination of the right experiences and the right people at the right times. I am thankful to everyone who helped (and continues to help) me along the way. Though my journey through aviation is nowhere near complete, in some ways I feel that it has come full circle. Each landing at a new airport recalls the days of exploring "strange new worlds" in The Fort with Bobby (who also went on to earn his private pilot certificate). The only difference now is that these new places actually look different (because they are different), rather than being imaginary embellishments of the same farm in Lake Orion, MI. It seems to me that "growing up" only means that the games we play become more sophisticated. Like Ron, I made a "snap" decision to pursue flight training. But I have to wonder, was it really that abrupt? I believe that the foundation built by my past experiences primed me to act as I did. Without those experiences, it is possible that my ride with Dave would have amounted to nothing more than an interesting, one-off memory.